We’re getting ever closer to Christmas and the gift-giving season! Buying presents brings with it the pressure of getting them gift wrapped, and sometimes one or two special gifts just need that extra something to take them to the next level. 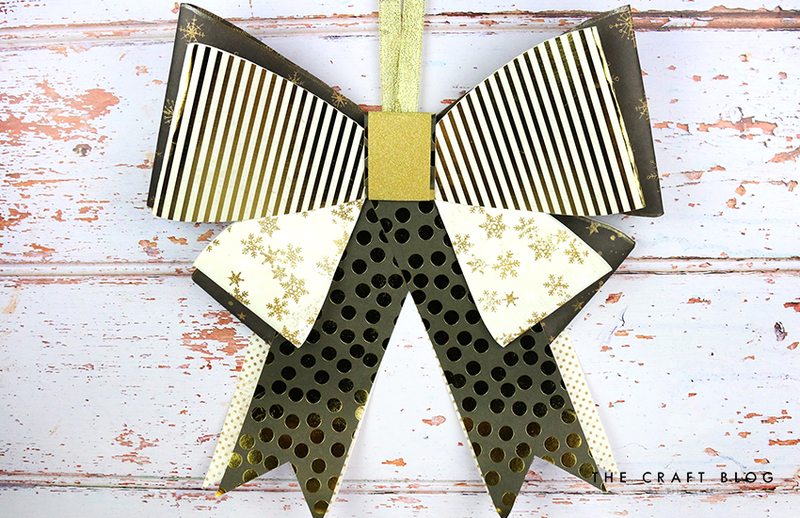 Add a finishing touch to your gifts with Grace’s Giant Gift Bow tutorial! Our wonderful DT member is today going to take you through the steps to creating a beautiful bow from your favourite festive papers. Measuring approximately 13” x 14”, this will really help you make a statement over the holiday period! With touches of glitter and gold foil, Grace has used the First Edition All That Glistens paper pad for this partilcular design. This giant bow would also make a wonderful alternative to a star or topper on your Christmas tree, or could be hung on an internal door in place of a festive wreath. Of course, you don’t have to limit this design to the festive season – get creative with your favourite non-seasonal First Edition and Dovecraft papers. Download your free template to help you create your own and read on to find out how! 2. Bend (do not fold, you don’t want there to be a crease!) each piece in half, and use the templates to cut the shape – the smallest part of the template being at the ‘open’ end. Use template one for the largest pieces, template two for the second largest, and so on, until you’ve cut all eight pieces of paper from step 1. If it’s easier you can glue the ends together for doing this, except for the two 5 x 11” pieces, which need to be kept open for a later step. 3. Take two more All That Glistens papers and cut two sheets to 4 x 12”, and two at 3 ¼ x 11”. Cut fishtail banners into the ends of these. To make sure they are exactly the same cut the banner shapes holding one paper on top of the other. To assemble the bow, start with all the biggest pieces. Attach the fishtail banner pieces together at an angle. 6. Add the circle on top, glue the ends of the bow pieces together if you haven’t already, and attach to the circle shape in a low ‘x’ shape as seen. 7. On top of this, add the smaller fishtail banner pieces. 8. Tuck the smallest bow pieces (made using template 4) partly into the pieces cut using template three, and glue everything together. 9. Then attach those bow pieces to the small strip you cut with scraps. 10. Cut another favourite paper (we used glitter card and backed it with a black paper so it would really pop!) to approximately 2 x 7”, and loosely bend this around the centre of the front bow, overlapping it at the back. Glue in place. 11. Using a strong adhesive (such as hot glue), attach the smaller bow piece to the larger, back piece, making sure the top of the circle holding some of the pieces together can’t be seen. 12. Finally, take a small length of ribbon or twine, loop it, and adhere it to the back of the bow, covering with another small scrap of paper or card. Your bow is now complete! If you’d like to add any extra decoration to the bow, it’s best to do this just after you’ve cut all the pieces and templates, but before gluing anything together – for example we added gold glitter marker around the edges of the black bow pieces. You could add glitter, buttons, and sequins, anything you like! Will you be making your own giant bow this festive season? We’d love to see if you do, so don’t forget to #Trimcraft when uploading to social media and to share your makes in the Inspiration Area.